Kona is a game that has been in early access on the PC for some time, but now it’s finished and released on both PC and consoles. 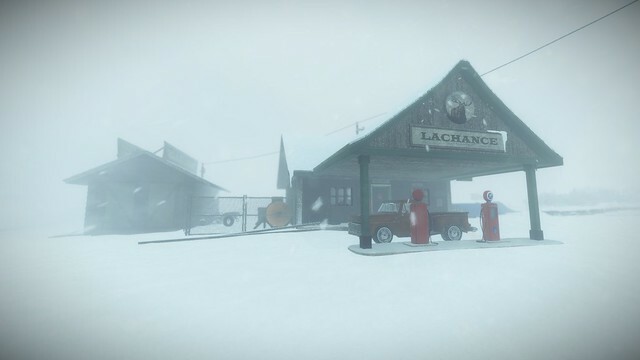 Set in northern Canada during the 1970’s, you play as a private detective named Carl Faubert. While the job he’s hired to do seems simple, once things get started it’s clear there’s a lot more going on here than Carl expected. Does this horrifying mystery game weave a tale that sends an icy chill down your spine, or does it get lost in the blizzards along the way? Having finished my playthrough, I’m ready to answer that very question. Let dive in! Kona’s premise is a solid one. Carl Faubert, a private detective who’s used to spying on cheating spouses or running boring old jobs, is suddenly hired by a wealthy industrialist by the name of William Hamilton. He makes his way up to a small town surrounding Atamipek Lake in northern Canada, only to find out that his client has been murdered in cold blood. This all happens within the first 20 minutes or so, and it sends Carl spiraling into a mystery that only grows from here. The entire tale is narrated by a third-party whose soothing voice waxes mysterious and profound questions with the occasional joke for good measure. Not every line comes across how it should, and there’s definitely some moments where it feels like the narrator could have done better with the voice acting, but overall, I enjoyed this method of storytelling. Carl himself doesn’t speak as a result, but that just makes it easier to put yourself in his shoes. While the murder of William Hamilton is the opening shocker, it’s far from the only thread that Kona weaves during its tale. As the game goes on, you’ll explore the houses of various citizens who have up and vanished. Through narration, documents, and some otherworldly events, you’ll learn a lot about the people who lived in this town. A major part of Kona’s story also focuses on the Cree, which is a local native tribe that has been pushed out of their lands by the aggressive purchasing of land that William Hamilton did prior to his untimely demise. I don’t know how the developers at Parabole did it, but they managed to weave together a story that deftly balances hardboiled detective themes, with supernatural and even horror elements as well. By the time you reach the end, these threads all tie up rather nicely as well, which is something many games fail to do. Kona could have easily botched the story by leaning too far into one particular element, but the developers managed to tie everything together in such a way that it all fits together like the pieces of a puzzle before the credits roll. Truly, that is quite the accomplishment in and of itself. I don’t want to offer any more details when it comes to story for fear of spoilers, but suffice to say, Kona takes on a lot of different elements and manages to handle them all with both grace and finesse not often seen in this genre. 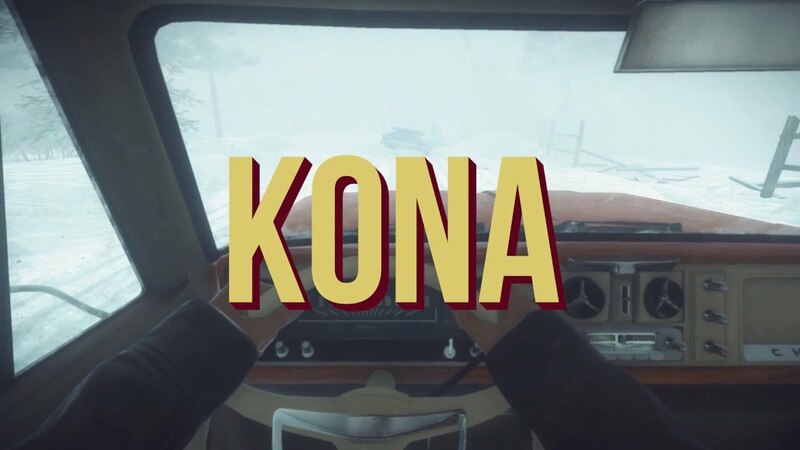 Kona’s gameplay places you in a explorable open world with some limitation. The bottom half of the map is available to you for the majority of the game. Once the upper half becomes available, it’s a more linear journey to the endgame. Throughout the game’s rendition of northern Canada, you’ll find plenty of things to see and do. Your trusty red Chevy truck allows you to get around fairly easily. While I found myself lost more than a few times, you can pull up your paper map while driving. I wouldn’t recommend doing this, though, because it obscures most of your vision. Moments of lost confusion aside, I eventually started to learn and understand Kona’s layout to the point where I could navigate based on landmarks in the game’s world. By the time I finished my six-hour journey, I felt like a local myself. Beyond simple exploration, Kona also employs an inventory management system, weapons, puzzles, and even survival mechanics. You’ll be able to go into houses and rummage through drawers and cabinets for items or materials like you would expect. You’ll also come across some fairly complex puzzles depending on how deep you explore the game’s world. One particular head-scratcher had me calling in my secret weapon, Christina, to use her expert-level puzzle solving skills. You’ll be rewarded for going off the beaten path in Kona as well. An alternate vehicle, some additional story developments, and a treasure hunt all await for those who want to see everything Kona has to offer. Throughout all of this, you’ll also need to survive the harsh winter conditions. You have a health, stress, and heat meter to manage during your time exploring. Stress can be managed with items like cigarettes and beer that keep this meter in check. If you let your stress get out of hand, you’ll sprint slower and use weapons with less accuracy. The heat meter is managed by building fires in the game’s world. You’ll find plenty of opportunities in houses to light a fire, and a few options out in the wild if you come across a campsite. Keeping the necessary items in your inventory is key. You’ll need three items to start a fire, and doing so not only raises your heat meter, but it’s also how you save the game. It’s a juggle, though, because your inventory capacity is based on total weight. Thankfully, you can stow items away in your vehicle for safe keeping. That’s what makes Kona so interesting. Just like the story, the gameplay manages to weave together a lot of dissociated elements in a way that works really well. I will say that the combat leaves a bit to be desired, however. Melee weapons have a lethargic feel to them and guns kinda just pop. Thankfully there’s not a ton of combat in Kona, so the issue isn’t too bad. I enjoyed how everything else fit together, and while I would have liked more supernatural/horror elements, the game’s tension in the final act was really well done. Kona is a good looking game on the PS4. While some textures can come across as low-res, the overall package is one that has a nice level of polish. The attention to detail is a standout element, as is the sound effects. The crunch of snow beneath your shoes and the howling of the wind is great if you’re playing with headphones on, which I recommend. The narrator sets a good tone, and the big reveals towards the end offer some really cool art design. While the music is really good at setting the tone and atmosphere, I will say that it could get repetitive if you stayed in one area for too long. It seemed to shift when you traveled to new places. Overall, Kona is a really interesting horror/mystery game with a great atmosphere, solid story, and a well-balanced mix of different gameplay elements. My only gripes are with the combat, and that I would have liked more of the supernatural elements that appeared throughout. It’s supposed to be the first in a series of games from Parabole, so I’ll be very interested to see what comes next. If you like mystery with a dash of horror, and you don’t mind handling survival elements, Kona’s ice-cold mystery should be more than enough to warm your heart.